Presenting a social history of colonial food practices in India, Malaysia and Singapore, this book discusses the contribution that Asian domestic servants made towards the development of this cuisine between 1858 and 1963. Domestic cookbooks, household management manuals, memoirs, diaries and travelogues are used to investigate the culinary practices in the colonial household, as well as in clubs, hill stations, hotels and restaurants. Challenging accepted ideas about colonial cuisine, the book argues that a distinctive cuisine emerged as a result of negotiation and collaboration between the expatriate British and local people, and included dishes such as curries, mulligatawny, kedgeree, country captain and pish pash. The cuisine evolved over time, with the indigenous servants preparing both local and European foods. The book highlights both the role and representation of domestic servants in the colonies. 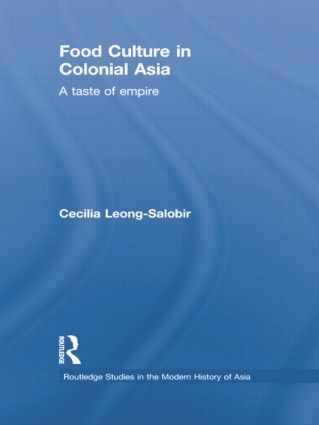 It is an important contribution for students and scholars of food history and colonial history, as well as Asian Studies. Cecilia Leong-Salobir is Honorary Research Fellow in the History Discipline (School of Humanities) at the University of Western Australia. Her research interests are food, world history through foodways and colonial empires in Asia.